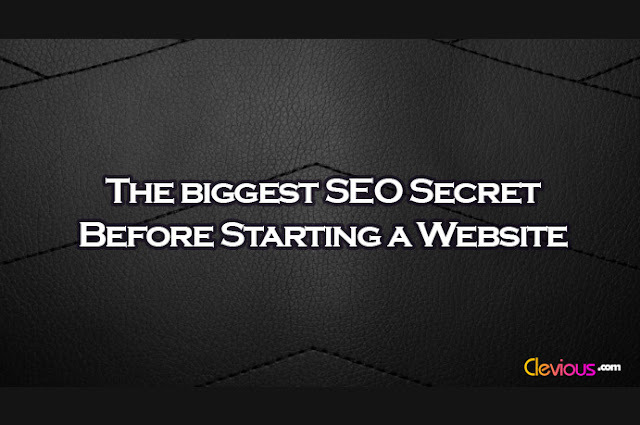 One of the biggest SEO secrets is to start optimizing the website for search engines before you launch it! You may ask, is this possible? My answer is yes, and it is indispensable. What does “choose a profitable niche” mean? Choosing a profitable niche is like defining the content of the website by asking the questions of what will my website contain and what will the main keywords of my articles revolve around? You may have read or heard somewhere something like “No, don't do keyword research”, “Don't try to find a profitable niche, just focus on a topic you are interested in and everything will be fine”. From an SEO point of view, it is not accurate because it is not taking into consideration the competition knowing the fact that you are not the only one who will be focusing on that particular interest, competitors too. Let's say you are interested in technology and then you decide to start a general blog, news or magazine on technology, will you be able to compete with established websites managed by a team of writers? Will you be able to control a site that needs hundreds of articles on tens of topics? It is going to be very difficult, not only for your website to outrank some of your competitor's websites but also for you to write tens of articles weekly on many topics regularly. For this reason, it is very important to choose a specific interest – for example, one or two topics on technology with less competition, if possible. To learn how to find a profitable niche, you can consult the article I wrote: “How to Find a Profitable Niche” to know my method of how I find a profitable niche quickly and easily. Right after defining your niche, you should choose a catchy name that is easy for people to remember. In the SEO World, websites like Backlinko and Moz are an example of a good name because they are easy to remember. You may ask, what does that have to do with SEO? Returning Visitors: They help your website’s visitors to remember the name and return to your website later after that they leave. Click-Through-Rate: They may help in increasing CTR: Users that previously visited the website and found it helpful may visit your website again through Google and Bing by clicking on the links to your articles on the search list, or by typing the name of your website on the search bar – given the fact that they remember the name. Look professional, much better than long names. Easy to mention on other websites without the need to copy and paste the link on Social networks, forums, blogs… etc. Easy to talk about – by mentioning the name in comments, blog posts... etc. Search engines are able to detect many of these user behaviors which significantly contribute to your SEO overall. If you really would like to give a big SEO push to your website, on top of the SEO strategies of choosing a niche, searching for keywords and optimizing content, consider its name too. To know how to register a domain name for cheap and to get some ideas on finding a name for your website, you can consult “How to Choose a Domain Name” article. “Essential Tools to Diagnose your Website SEO Problems”. Many Themes today have a Demo website; before selecting a Theme, you can apply on them the different SEO tools to see which one is optimized for search engines. Website Loading Speed: The website should load quickly. Website Structured Data: It should contain Schema Markup, Facebook Opengraph, and Twitter cards. If you have successfully satisfied the 3 requirements before starting your website, you are on a good way to building a successful website. Bear in mind that these three steps are very important but not sufficient alone: you should also be able to write quality articles, optimize your website content and minimize SEO errors. For a quick guide on how to achieve some of these, check the article “How to SEO a New WordPress Website” which will be a good starting point for how to optimize a website for search engines. By using the tools that I shared in that article, you may find some specific SEO issues that I did not cover there because they vary from one website to another. You can fix them by reading the instructions given by those tools as well as using WordPress plugins which are specifically made for that purpose.